Dr. Karan graduated from Northern Illinois University with a major in Biology and minor in Chemistry. He then attended Indiana University school of dentistry where he received his Doctor of Dental Surgery degree in 2013. As a dentist Dr. Karan is really passionate about the dental profession and loves interacting with his patients. 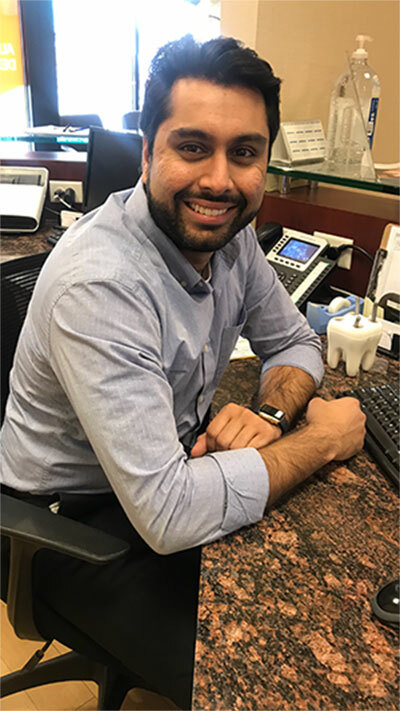 He makes it his main priority to carefully understand his patient’s oral health care needs to help them achieve a smile they have always dreamed of. He also focuses a lot on educating his patients to achieve optimum oral health, and stays current with the upcoming technological advancements so as to provide quality oral health care. Dr. Karan is a member of American Dental association, Chicago Dental Society, Illinois state dental society, and the Academy of General Dentistry. In his free time Dr. Karan loves to travel, play sports, snowboard and hang out with friends and family.